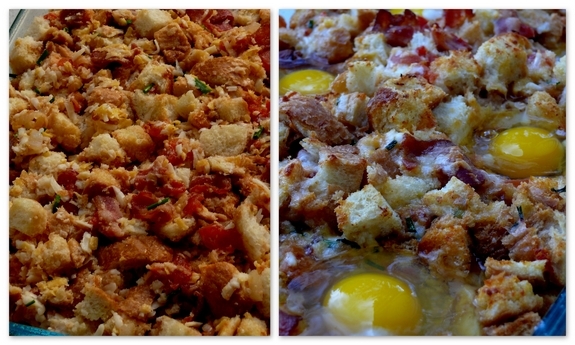 A Bacon, Tomato and Cheddar Breakfast Casserole with Eggs that is baked to perfection and the perfect morning bite for a brunch or holiday meal. 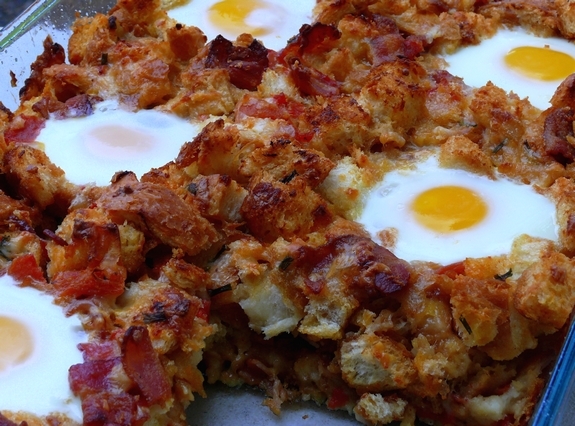 Let start by saying that the flavor in this breakfast bake is absolutely fantastic. We couldn’t stop eating it. My husband came out of his cave (office) four times while I was making this. The aromas were just so hearty and comfort-food-smelling, he couldn’t stay away. Between the knock your socks off flavor, the crisp bottom and the chewy moist bread…this is a breakfast you want to wake up to. The truth is, it’s great for dinner too. It’s one of those meals that you take the first bite and throw your head back as you are experiencing the incredible flavors. If you have a houseful coming home for the holidays, I recommend making this…however, with food this good, they may not go home!! I think this might just be on the Christmas breakfast table…it’s that delicious. Try it for yourself…you will see! 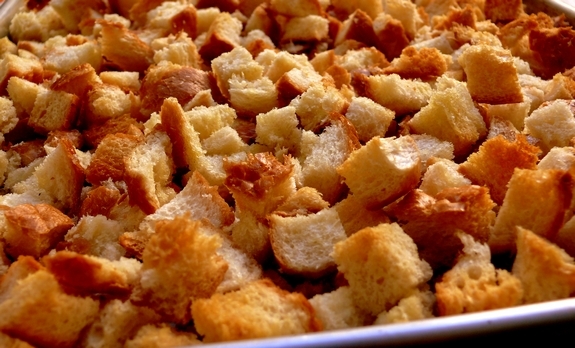 Return the toasted bread cubes to the bowl. Add the contents of the skillet, along with the bacon, shredded cheeses, chives and broth. Stir until the bread is evenly moistened. Spread the mixture in the baking dish and cover with lightly oiled foil. This is the perfect little nest for an egg…you will not be disappointed! Preheat oven to 350 degrees F. Lightly oil a 9 x 13 glass baking dish. In a large bowl, toss the bread with the olive oil and spread on a large rimmed baking sheet. Bake for about 20 minutes, tossing once or twice, until the bread is golden and lightly crispy. 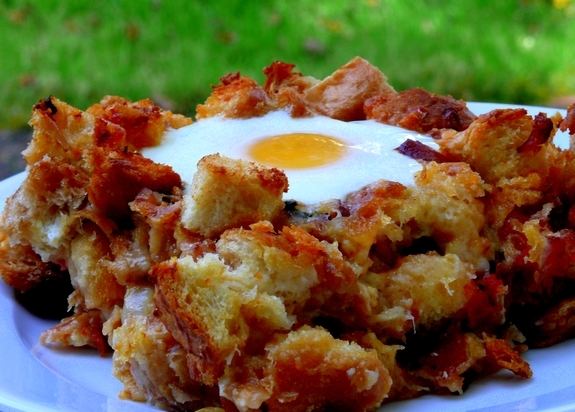 Excuse me while I go wipe up the drool from my desk… I will be making this breakfast bake on Saturday! I’ll have to put cheesy scrambled eggs on DH’s side, but I think it will be delicious both ways! Thank you for putting this recipe on my radar! would this work for scramble eggs, if so, how would you do? This looks amazing!! Wow! That looks unbelievably good! 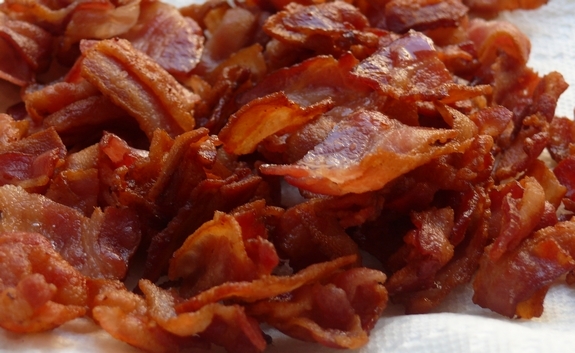 Anything with that much bacon has got to be delicious. I love how the eggs are baked whole. Very nice! Oh. My. What a great sight to wake up to this morning! This looks amazing and I cannot wait to try it! I’m always looking for breakfast-for-a-crowd recipes. Oh….I wouldn’t. Scramble them and put them on the side. I can’t wait to make this. I wish I cold have it for breakfast this morning. I will serve this when I have my Christmas brunch. Thanks! YUM! I was looking for something to make on Christmas morning and now the search is over! This looks delicious. I plan to make this at my first opportuity. The only thing I might change is replacing the tomatoes with sun-dried. 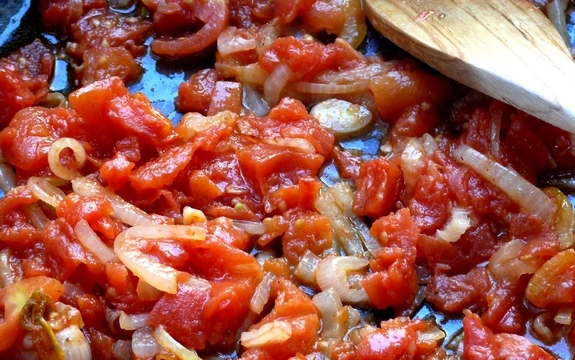 I’m totally addicted to them and use them whenever a recipe calls for tomatoes; otherwise, WOW! I was half expecting the carb to be potatoes, but I will DEFINITELY be making this with the bread! Great timing! Oodles of family going to gma’s for Thanksgiving – this will be perfect for the “family” breakfast! Can hardly wait to dig in! Before I even read that you suggested this for Christmas morning I had already cut and pasted the recipe with that note attached! Some flat leaf parsley or cilantro over the top and it would literally look like Christmas! I don’t know where you find the time between making and selling your wonderful wine and raising your family but I’m glad you do – your recipes are always ones I want to make immediately! I just love this meal and will have to try it very soon. I’m hungry as it is, so this just leveled me. i could really use some of this right now! GOOD GLORY!!! I must now go see if I have the ingredients…for dinner…I too, might be drooling. Ooh baby that looks good! Yes please, lots & lots of this breakfast. Stat! Oh, this will be on my table Christmas morning! I’ll be making a batch before then, just to make sure its yummy… Like it wouldn’t be or something! Oh, I want that now! How beautifully that breakfast turned out! It is so pretty and has the perfect ingredients to satisfy anybody. That would be perfect for overnight guests. Also your photography is excellent. Congratulations to the winner of the Kitchenaid Mixer. That was a fun giveaway. Looking forward to the next one! This looks so beautiful! What a perfect holiday breakfast for Thanksgiving or Christmas! I can’t wait to try it! This looks delicious! I’ve been looking around for some new breakfast recipes. I host my family (20+) every year for Christmas Eve and every year we choose a different theme for the menu. This year is breakfast/brunch so I may just have to try this one. Thanks for sharing the recipe. best vehicle for eggs ever, and i’m not exaggerating in the slightest. Garden Suite is a self catering cottage offered by Fullham Lodge. The sea view from your double bed room will take your breath away, as will the comfort and sheer spaciousness of the lounge area. The Garden Suite also boasts a private patio and seperate entrance, giving you unlimited freedom and privacy. We are having this for Christmas brunch! Looks marvelous! just found this through pinterest. this is amazing. my kids and husband saw me looking at this picture and are now begging for me to make it!!!! This will definitely be made the next time I have weekend company. I’ve made this twice and it was the first big breakfast dish I made, but it’s so good I can’t find a single thing tastier which has since then created really disappointing breakfast experiences. If I could I would make this at least once a month. This is the best breakfast you will ever make. I don’t know where you find your ideas for recipes but I want to make each & every one! Maybe a cookbook is in your future???? This is why I love you to bits. Looks delectable…has anyone made it ahead to the egg baking stage? That would be the ultimate. Would it be possible to add potatoes to this? Possibly 1/2 bread 1/2 potatoes? What would be the best way to incorporate potatoes, you think? Could you make this ahead of time and leave it till the next morning and put the eggs in then and finish the backing? Anyone have suggestions on how to incorporate white mushrooms or is that a bad idea? 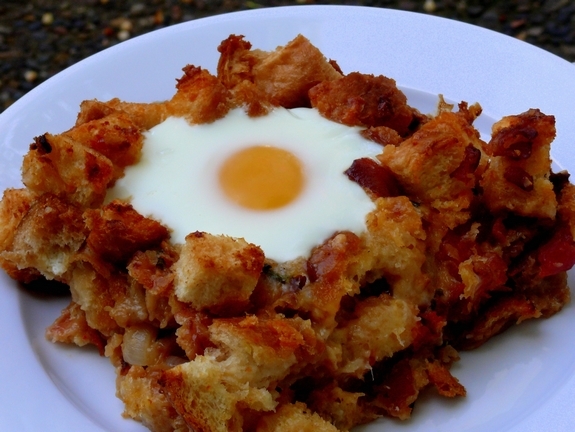 I’m trying to make a casserole with as many traditional Irish Breakfast items as possible. I would just cook them at the same time as the onions. I love mushrooms, bet it will be great!